I love to bake. It's something I really enjoy and think I do fairly well. I express love to my family with ooey gooey goodness from the oven. But, we've not had a oven in a month and a half. What's a girl to do? I figured out how to bake in my crock pot. I've made banana bread, wheat bread, a few quick bread mixes, and muffins so far. A loaf pan or the aluminum foil muffin tins fit great in my oval shaped crockery. I just had to experiment with the times to figure out how long each thing takes to cook. The end result is really good and it doesn't heat the house up as badly as regular baking. So, I can still bake, sort of. It nices to bve able to give some sweetness to my loved ones. You might give it a try! 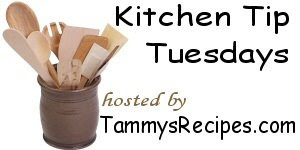 Click the button at the top there for more great kitchen tips over at Tammy's Recipes! Ok...now I am going to have to try these!